Pakistan’s energy sector is in crisis. Inadequate electricity supplies cost the country US$14 bn annually and some 11,000 small and medium enterprises operate at just 60% of capacity. In 2015, Pakistan’s Ministry of Climate Change and the Punjab Power Development Board asked the Climate and Development Knowledge Network (CDKN) to assess whether a Nationally Appropriate Mitigation Action (NAMA) would be an appropriate tool to support renewable energy solutions for Sialkot in the Punjab, one of Pakistan’s most emblematic industrial hubs of mainly export-oriented industry. 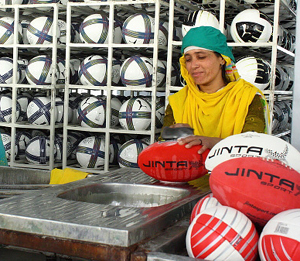 For example, the factories of Sialkot supply 40 million footballs a year, rising to 60 million in World Cup years – an estimated 70% of the global production of hand-sewn footballs. The CDKN-led project to assess a Nationally Appropriate Mitigation Action (NAMA) as a policy tool to provide renewable energy to the city’s industrial sector showed that the use of photovoltaic panels for industry could mitigate up to 377,000 tons of carbon dioxide and gain average savings of US$27,400 per year on electricity costs. Industry should have the opportunity to influence the NAMA process from the start, validate results mid-way and have a permanent presence in subnational decision-making on climate change. This builds trust, increases the legitimacy of results and improves management. Sharing preliminary data with stakeholders can help to spark debate. It is not necessary to await ‘perfect’ data before engaging; rather, data and analysis can be improved through stakeholder feedback. Providing examples of financial schemes from other NAMAs or similar projects can help to unlock the dialogue and stimulate action to secure investment.